All are welcome to the Flushing meetinghouse this May 16-17 as part of New York’s “Sacred Sites” Open House! We will have tours and refreshments from 12-4pm on both Saturday and Sunday that weekend. You are also invited to worship with us Sunday 11AM. Flushing Meeting of the Religious Society of Friends will be collaborating with the Bowne House Historical Society and St. George’s Church to organize a “Flushing Historic Sites Weekend” for our community. 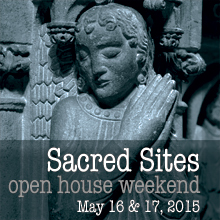 Each spring, congregations throughout the State open their doors so neighbors can experience first-hand the wonderful art, architecture, and history embodied in New York’s Sacred Sites. Visitors also learn about the crucial social and cultural programming these magnificent religious institutions provide their communities as well. This year’s Open House Weekend, “Celebrating New York’s Diverse Houses of Worship”, is being organized as part of the 50th anniversary of New York City’s Landmarks Law and is scheduled for May 16-17, 2015. • To encourage sacred sites to open their doors to the general public. Inviting visitors is a great way to build broad community support for the ongoing preservation of historic institutions. • To inspire residents to be tourists in their own town, introducing non-members to the history, art and architecture embodied in sacred places. New Yorkers tour religious sites around the world but may overlook those in their own back yard. Developing cultural tourism is key to the future of sacred sites. • To publicize the many programs and services religious institutions offer their neighbors. The important work these sites provide benefits the entire community – not just the congregation’s members- and help ensure the congregation’s future. For more information, visit the New York Landmarks Conservancy.